Premium Magnetic Green Chalkboard with Maprail. This chalkboard is constructed of Porcelain Enameled Steel. Porcelain Enameled steel is magnetic, resists ghosting and scratching, and is guaranteed by the manufacturer for 50 years. 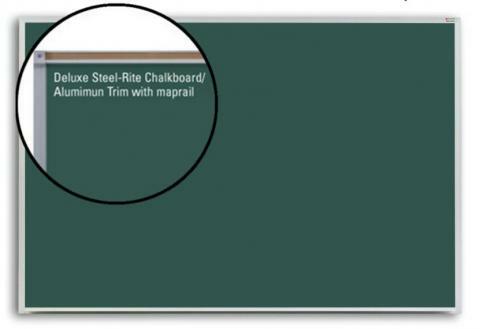 The high contrast green chalkboard surface is framed in an Anodized Aluminum Trim with a full-length tackable maprail and chalkboard accessory tray. Choose your Chalkboard Size.